I love flipping through home decor catalogs for seasonal inspiration but can never quite convince myself to pay the sky-high prices for holiday decor. 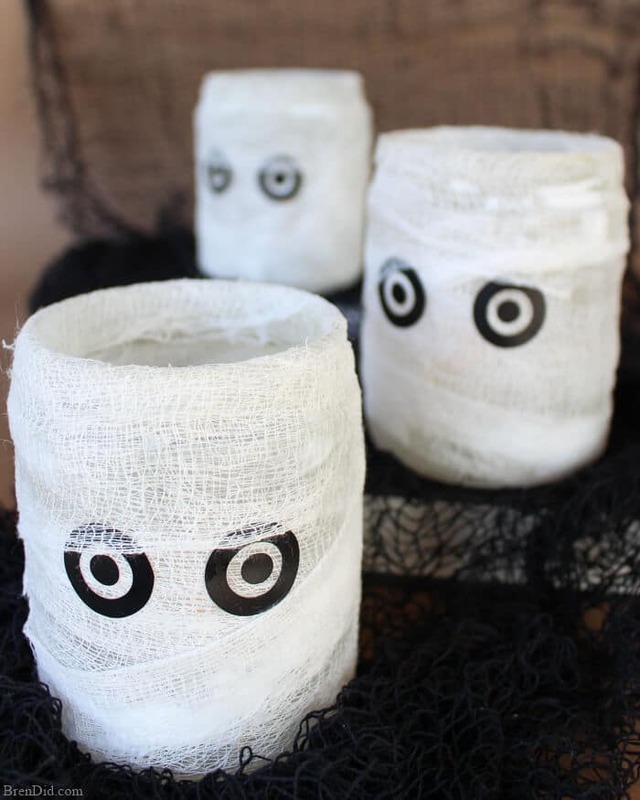 Learn how I make this easy homemade Halloween decoration that looks just like a Pottery Barn candle holder for less than $3.00. Each season you can find me drooling over the holiday catalogs from my favorite upscale decorating companies such as Pottery Barn, Williams-Sonoma, and West Elm. 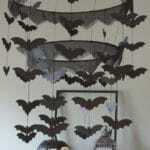 I adore their home decorating style, I hate paying high prices for holiday décor. 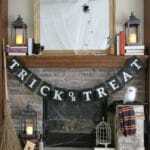 I’d rather skip the $30 Halloween garland and save my money for big décor items that have more impact (I’m currently saving for a massive ottoman). 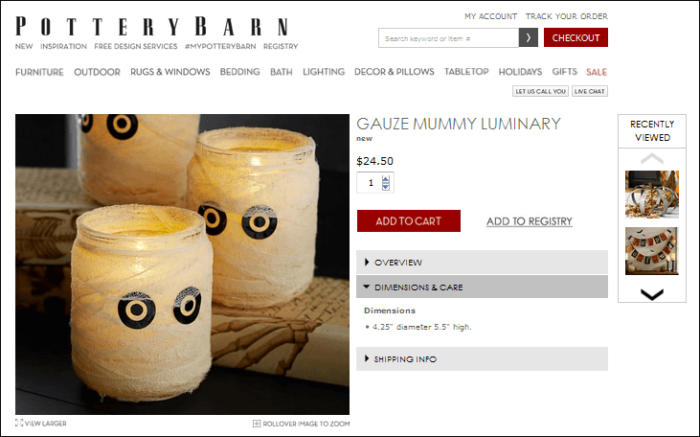 Still, a girl can dream… and the fall Pottery Barn catalog had me captivated with its creepy Halloween Pumpkin luminaries, vintage Burlap Banners, and spooky Mummy candle holders. I had to put the catalog down and walk away before my budget was blown! An upcycling idea stuck me while I was serving Healthy Chicken Tacos for dinner (inspiration strikes in the weirdest places). 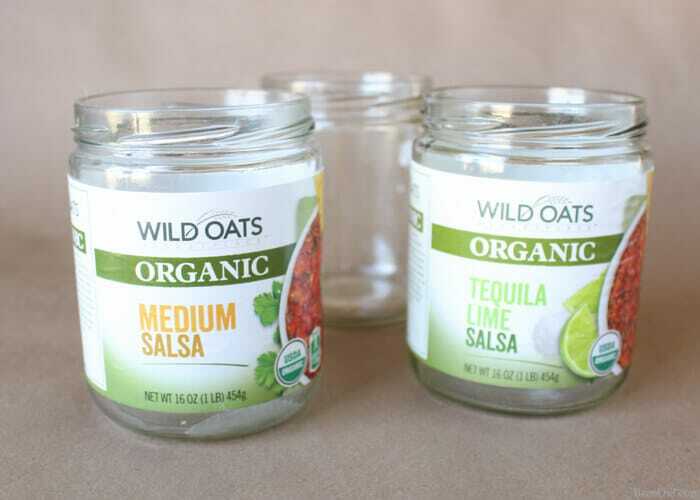 Somewhere between the avocado and tomatoes I realized that my favorite salsa is packaged in a jar that is nearly identical to the shape of the Pottery Barn Mummy Luminary. I double checked the dimensions online and then decided to transform a few jars into an easy homemade Halloween decoration for my mantle! 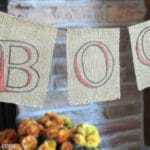 I love this knock off project because it uses basic craft supplies and recycled glass jars. Our garbage service stopped recycling glass, so I am always happy to have a use for some empty jars. 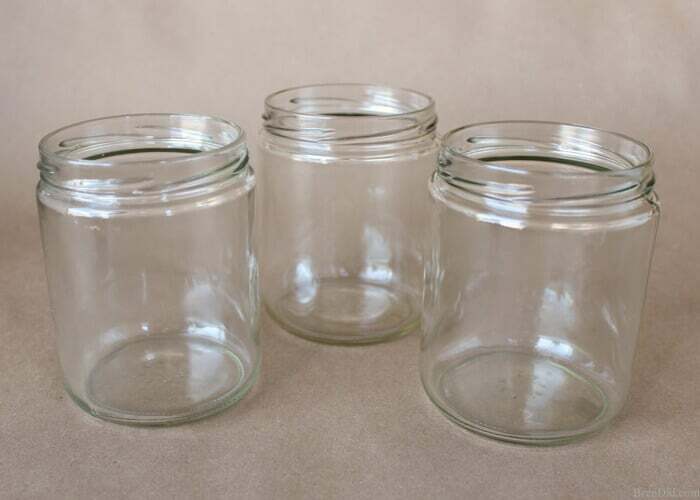 Glass jars, approximately 3.5-4″ diameter 5.5″ high. Peel off labels and clean jars. Use nail polish remover to remove the printed on expiration date. 3. 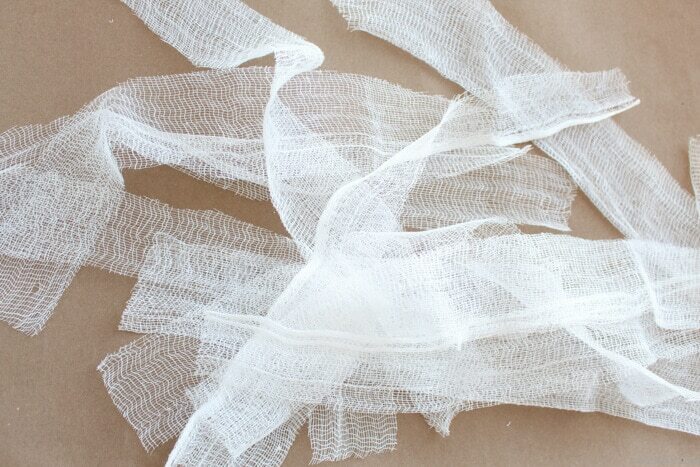 Cut the cheese cloth into 1.5-2 inch wide strips that are 12 inches long. 4. 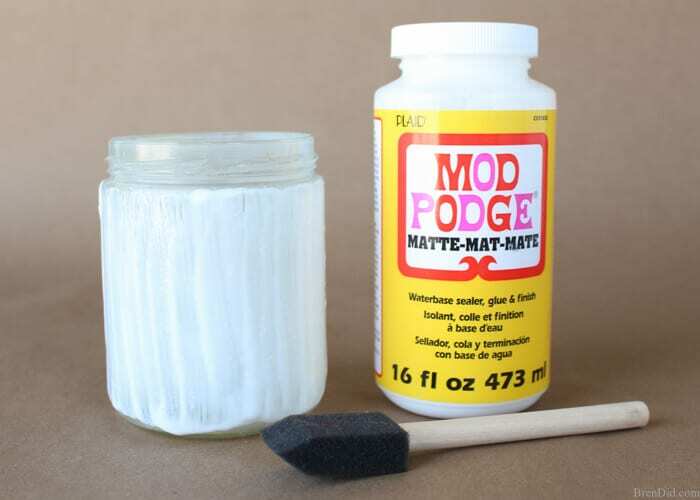 Paint the outside of the jar with Modge Podge. 5. 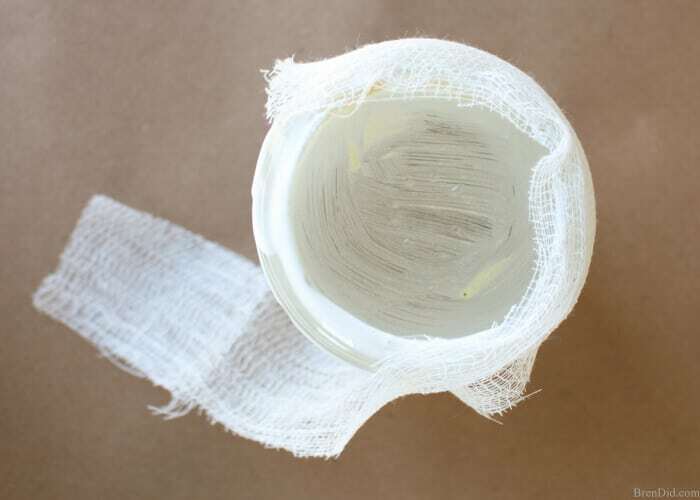 Wrap the jars with the cheesecloth; make sure it sticks to the Modge Podge. 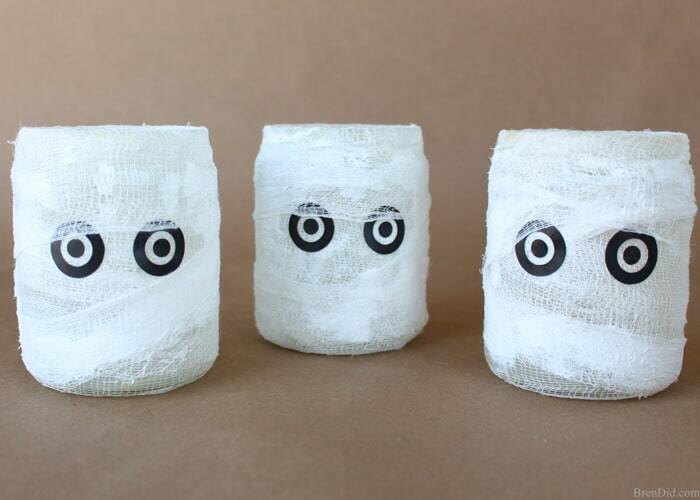 Crisscross the cheese cloth “bandages” around the jar a few times to make it look more like a mummy. Make sure to wrap some over the lip of the jar and under the bottom edge. (Reserve one piece of cheese cloth for step 8). 6. Cut out black eyes. Download the PDF pattern or Silhouette cut file in my free printables library. Place the eyes about 1/3 of the way down the jar and 1-inch apart. Stick them to the jar while the Modge Podge is still wet. 7. 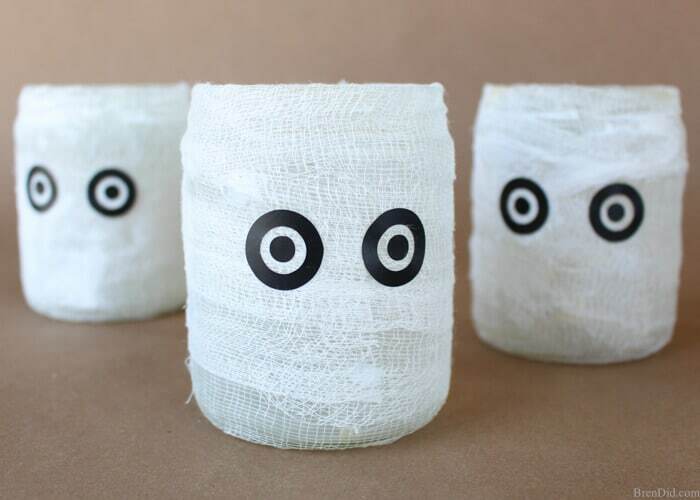 Use the final piece of cheese cloth to wrap the jar, draping it over a portion of the eyes. 8. 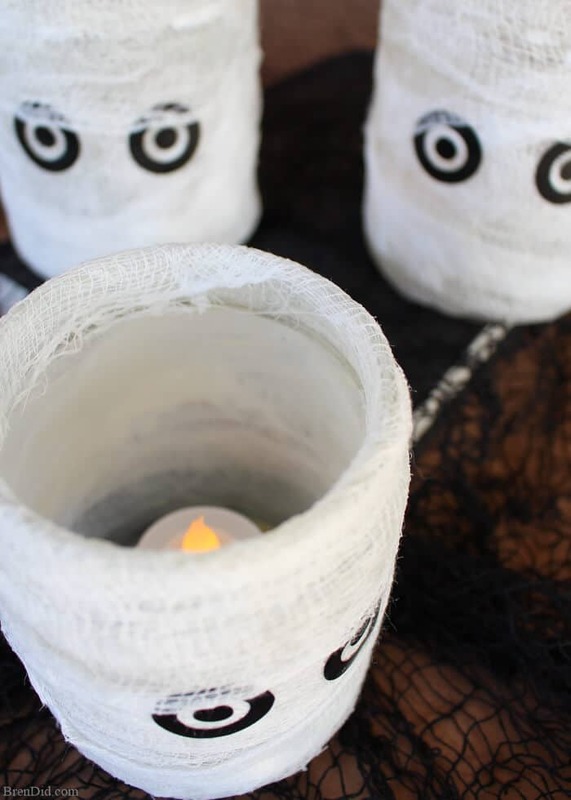 Allow the jar to dry and light with a battery operated votive candle. 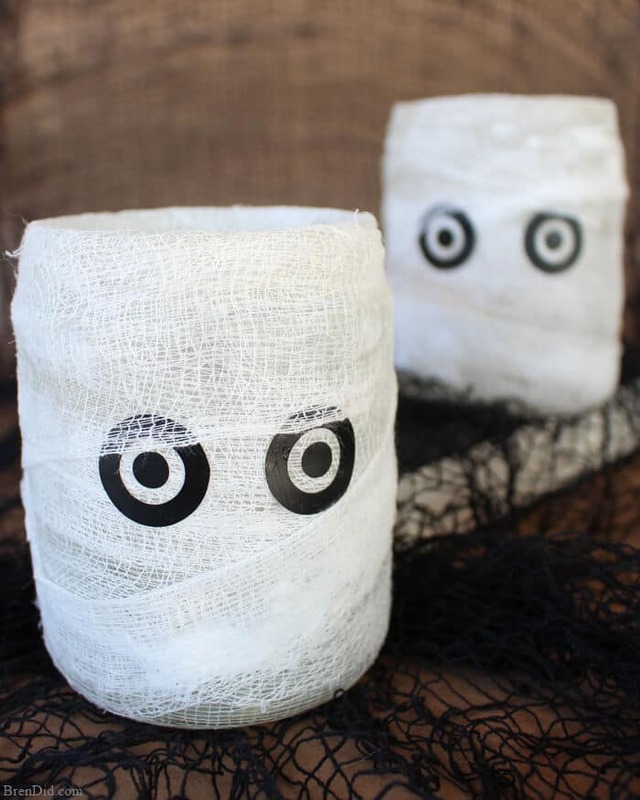 The original Mummy Luminaries sell for $24.50. My knock off version saves 90% off retail price! 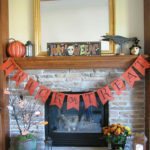 That's what I call a win-win-win… I get a great new homemade Halloween decoration, save money, AND recycle! Like my easy craft tutorials? Sign up for my free newsletter below and never miss a thing! Hi! Love these! I have a question though: Why do you need to paint the inside of the glass? If you left it “clear” wouldn’t it show the candle better? 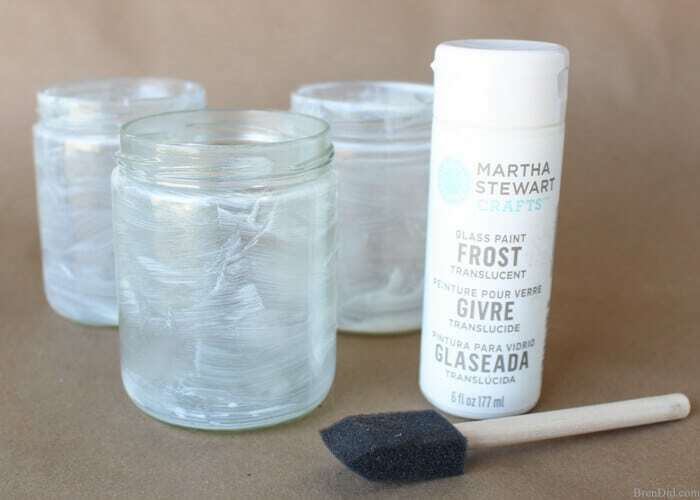 You don’t have to paint the inside of the jars if you like more light. I wanted a muted glow so I painted the inside of the jars. 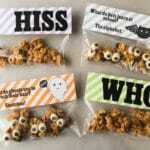 doing these for a 4th grade class halloween party – thank you Bren for taking the guesswork out. I bought Krylon Frosted Glass Finish spray paint to coat interior for frosted look vs. painting all 25 by hand w/ foam brush. Also bought Spritz googly eyes with self adhesive sticky at Target in 10 counts at Target. Bought 1/2 pint Ball canning jars as I did not have 25 glass jars – but will now begin saving for next year’s class party for our younger child to avoid buying jars next year. What a great idea, Heidi! I hope they project goes well. 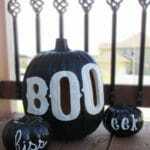 I have a railing around the front porch that is just screaming for this idea! Question??? Does anyone know where to get the electric tea lite candles? I have never seen electric tea light candles. I buy battery operated ones at the Dollar Tree, Target or Michaels. Yeah, that’s what I meant ” battery operated” tea lite candles. Thanks for the correction and the 411 on where to obtain said battery operated tea lite candles. Those are great. I think a googly eyed variation would also be fun. Thanks Kevin, you’re right google eye would be fun! 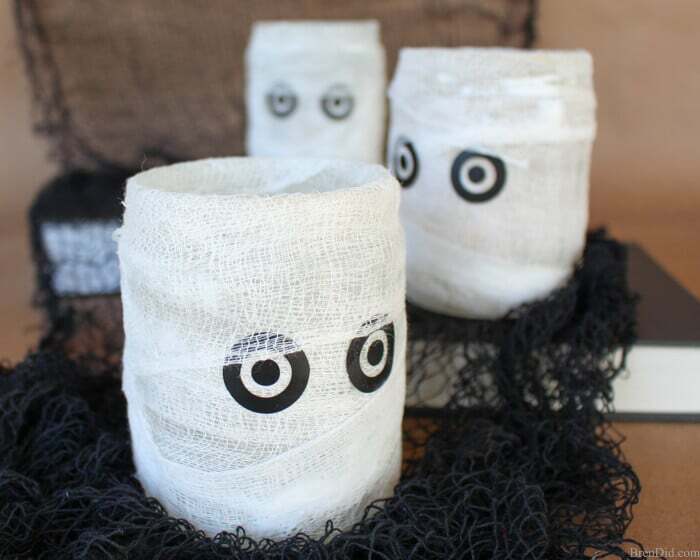 These are adorable and I love that they are upcycled!